December 7th, 2015 | Organizing and Decorating, Packing Tips. You planned, packed, ran last minute errands, and journeyed for a long time. When you eventually arrive at your new home, the adventure will continue on, only this time, you’ll have to unload everything and set up your house. 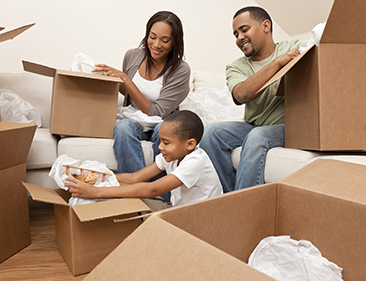 Luckily, we have some simple tips to help you unpack with ease. Items in their proper place help you feel at home. Unfortunately, most people arrive in their new home only to find piles of cardboard boxes. How do you avoid feeling overwhelmed? You need a plan to unpack the smart way. Stop and take a moment to think about each room, including the kitchen, living area, bathrooms, and bedrooms. Which ones do you spend the most time in? Next, consider what you’ll want access to first. Many people wisely pack an “open first” box, which provides immediate use of essentials. Apply this same philosophy to your entire strategy: unpack the essential rooms first. Most people use their kitchen more than any other room. After all, you and your family need to eat, and takeout only satisfies for so long. You can take advantage of a nearby drive-thru for the first couple days, but an organized kitchen relieves stress and helps you feel at home. Begin with the most breakable items first, such as dishes and other glassware. Try to imagine where you’ll want things, such as hot pads near the oven and glasses near the sink. Next, unpack your pots and pans. Then proceed to arrange your dry goods and other pantry items. You now have the bare minimum needed to craft quick and simple meals. First needs include food and rest. You’ve dealt with food already, so unpack the essentials to prepare your bed for the night. Now that you’ve unpacked your bed, don’t worry about the rest of the bedroom for now. Bathroom toiletries represent your next need. When you have these hygiene items at your disposal, feel free to rest until a new day dawns. If you have copies of them, use floor plans beforehand to make decisions about where you would like larger furniture to go. Once you know where you want larger items, you’ll know how to arrange the rest of your things. Furniture, linens, and the TV should come before pencils, tissues, and other small objects. Alternately, you can also start with a large object and focus on the smaller items that fill it. For instance, decide where your bedroom dresser goes, assemble it, and then focus on clothes assembly in each drawer. This “big, then smaller” tip works for an office desk, the living room ottoman, and even the china closet. Also, watch out for distractions. Distraction from one task comes easily as you walk by other things you need to set up or unpack. Focus on small areas to accomplish one task at a time. Such focus prevents wasted minutes or hours while you try to do many tasks simultaneously. Avoid exhausted or otherwise negative attitudes, especially in your new home. Plan your new space and have fun doing it. Think about convenience and accessibility. A new space presents many possibilities for comfort and organization. Take advantage of the chance to have your home exactly as you want it. If you want to keep your skis right next to the front door, indulge and put them in the front coat closet. Focus on the freedom you have to make this the most enjoyable part of your move. For more tips on efficiently and safely moving from one home to a new one, check out the rest of our blog.